The Garage team made it down to Baker City, Oregon for the 3-day, 4 stage Baker City Cycling Classic. This was a targeted race for the team, so we sent our best and put them up . The weekend best described pictorially by events at the Oregon Trail Motel. 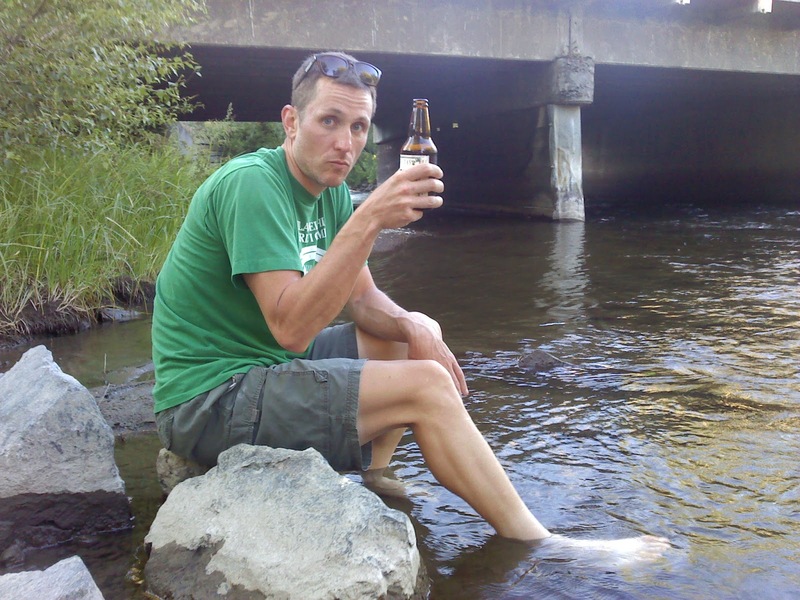 Joe Baum demonstrates how our stage one recovery beverages were consumed with feet dunked in the Powder River, located just behind the motel. Healing for the feet & soul. Joe's recovery treated him well the next morning, finishing 11th in the morning's time trial and 3rd in the evening criterium. Nice! 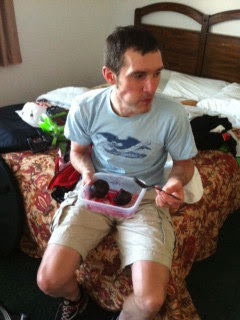 After the stage 2 time trial I decided to demonstrate how to eat a massive amount of beats. My strategy was to bring my A-game with B-equipment. Saddle failure on stage one, loose cassette lockring on stage 2, tire blowout on stage 3, and rear derailleur explosion on stage 4. Doh! 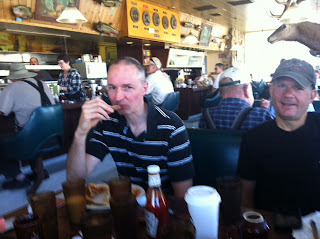 Champs of the race chose to onboard calories at the motel's adjacent diner. Stay at the hotel includes a coupon for breakfast. Hot debate was which breakfast option would be the best fuel for the day. I need to figure out what Jason ordered for stage 4. Whatever it was got Jason into the break of the day and 5th for the day up Dooley Mountain. Meanwhile Lang followed my lead of odd mechanicals by managing to have a rear brake pad fall out during the rollout of stage 4. That didn't hinder anything when the roads turned uphill, Lang took 9th on the day and 6th for the weekend. Fantastic job by the team, two top tens on stage 4 and two top tens for the weekend!